OSWEGO — “Once Upon a Mattress” will aim to be a treat for eyes and ears when it takes the stage at SUNY Oswego’s Waterman Theatre starting with a preview at 8 p.m. April 18. The college’s theatre and music departments will present the comic tale at 8 p.m. April 19, 20 and 27, with a concluding matinee at 2 p.m. April 28. 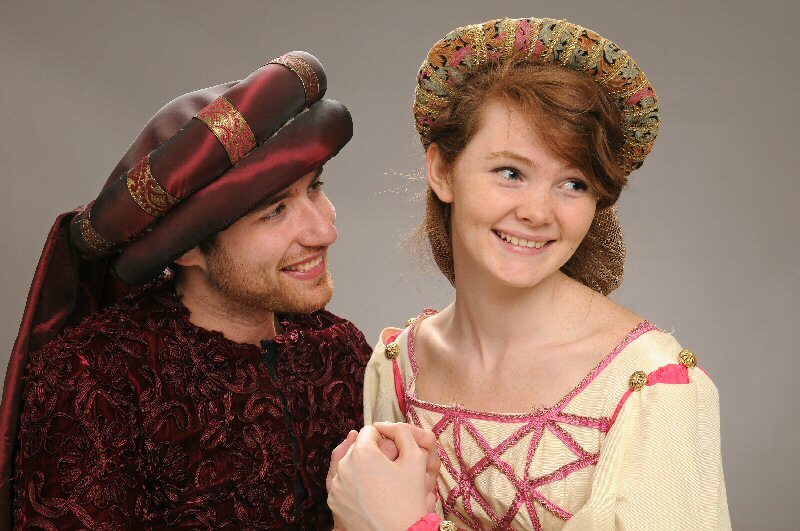 The SUNY Oswego theatre and music departments’ production of “Once Upon a Mattress” will feature what one cast member calls “luxurious” costumes of the era, including those of Daniel Stalter as Sir Harry, left, and Sierra Meisser as Lady Larken. The comic spinoff of the fairytale “The Princess and the Pea” will preview April 18, and run April 19, 20 and 27, with a finale April 28. Dr. Clay Price, director of choral activities at SUNY Oswego, will direct the music for this production. Stephen Nachamie, a veteran of New York City theatre, will direct and choreograph the musical. 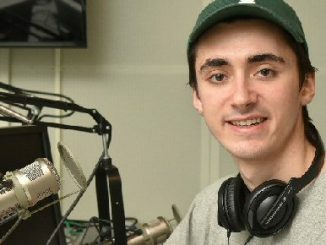 Patrick Ostwald, a SUNY Oswego junior theatre major with a minor in audio production, will take charge of sound design for the production. The main challenge, he said, is the “sheer number of microphones being used.” There will be 26 to 28 wireless microphones in use throughout the show. “I’ve been doing this since the seventh-grade talent show,” Ostwald said of his sound background. At home in Lake George, Ostwald runs a sound-design business for concerts and theatre productions. He has also worked as a sound designer for the production of “Once Upon a Mattress” at the Lake George Youth Theater. Sound design has two parts: the system design, which involves the equipment, and figuring out how to align sound effects, dialogue and the orchestra. The rest of the crew includes faculty and staff members Tim Baumgartner, scenic design; Kitty Macey, costume design; Judy McCabe, costume shop supervisor; Greg Brewster, lighting design; and Sean Culligan, technical director. Suzayn MacKenzie-Roy, a 2008 SUNY Oswego graduate, will serve as production stage manager. Student crew members, besides Ostwald, are Rob Kristel, dramaturg; Ashling Costello, stage manager; Rebecca Anne McCarthy, assistant director; Brianna Colombo, assistant set designer; Julia Kulaya, assistant costume designer; Tyler Eldred, assistant lighting designer; and soon-to-be Oswego freshman Rachel Kepler, projections. Benjamin Rebstein, a junior communications and social interaction major who will play King Sextimus the Silent, had regal praise for the costume staff. Dan Williams, a graduate student at SUNY Oswego, will play Queen Aggravain, and he is looking forward to wearing the costumes to help his character “kick it up a notch.” As a male playing a female role, Williams will become very familiar with the royal dresses. Tickets are $13 ($7 for SUNY Oswego students) and are available at all college box offices, online at http://tickets.oswego.edu or by calling 312-2141. Tickets for the preview on April 18 cost $5. Parking is included in the cost of the ticket, and is available in lots E-6 in front of Culkin Hall and E-18 at the rear of the parking lot behind Hart and Funnelle halls.